This article describes how to create "documinutes" (60-second documentaries) through a five-part instruction module used for filmmaking instruction in public libraries. Choosing a subject for a Documinute is exciting. There are so many possibilities that a person could literally make a documentary about anything that can be videotaped. When choosing a subject, a filmmaker may be passionate about a certain topic already. This is a great starting place! If someone already has a passion for something, then they are on the right track. I find that it helps organize the planning if one approaches their Documinute subject by first identifying whether it is event-specific, person-specific, or self-made. When choosing a subject for a documentary it is helpful to consider if there is an event that will occur at a specific time and place. Event specific Documinutes I have made feature subjects such as: a hair show, a printmaking class, a performance art exhibition, and a dogs-only swimming day at the pool. These events were going to happen whether I videotaped them or not. I did not organize the events myself, but I knew about them and got permission to videotape them. Making an event specific Documinute removes the burden of scheduling the shoot from the filmmaker. The filmmaker doesn’t have to make the event happen, they just need to show up to document it! For an event specific documentary one will need to videotape the event and interview separately. For an event specific Documinute, it is usually best to plan for the interview to take place after the event has occurred. A person who is organizing or participating in an event might be too busy or nervous to do an interview before or during the event. If the interview is conducted after the event, the filmmaker can ask questions inspired by what has already been filmed. The interview subject is likely to be relaxed because they will be relieved the event is over. Another advantage of shooting the interview after the event is that the interview subject might have more insightful comments because they will be reflecting on the past. Another approach to choosing a subject is to interview an interesting person. A shoot of this type will not have a predetermined event so the filmmaker will need to schedule both an interview and a demonstration. I have made several Documinutes that revolve around a single individual. Some of these individuals were: a cartoonist, a glassblower, and an animal shelter worker. For these types of shoots I interview the person for 30 minutes, then videotape them doing a demonstration for 30 minutes. If an interview subject is not sure what to demonstrate, the filmmaker can ask to see examples of some of the things mentioned during the interview. The final method for choosing a Documinute subject is to consider if there is something the filmmaker would like to document about themselves. If this is the case, the filmmaker will need to decide whether to enlist the help of a camera operator or simply do everything on their own. If one decides to make an acollaborative (Small, 1994, p.25) or solo film, then a tripod will help tremendously. This type of Dcouminute will require shooting two separate parts: an event / demonstration as well as an interview / voice over. Event-specific. What is an event that I would like to videotape? Who can I contact to get permission to videotape this event? Who can I contact to ask if they would be willing to be interviewed about this event? Person-specific. Who is a person who I find interesting? How can I get a hold of this person to ask permission to film them? Self-made. What is something I do that I would like to document? What would I capture on camera to visually convey this thing? Would I record voice-over or interview myself about this thing? 1. Decide on the interview subject. 2. Get permission to film. 3. Schedule a time for the interview. When someone agrees to be interviewed for a Documinute, it may create feelings of anxiety for the filmmaker. It’s natural to be nervous because one wants to do their very best. One way to alleviate feelings of anxiety is to prepare as much as possible ahead of time. Having a checklist handy during the shoot is a way filmmakers can feel reassured that they are getting everything they need to put together a documentary. Fortunately, there are three easy things one can do which cover many of the basics of getting a good interview. First of all, a filmmaker should strive to be polite. The filmmaker should make it a point to arrive on time and thank the person who has agreed to be interviewed. Before starting the interview, the filmmaker can put the interview subject at ease by asking them how their day is going. Another good icebreaker is to make a positive comment about an uncontroversial topic like the weather. Taking a few extra moments to start off on the right foot will make the entire interview experience more pleasant for everyone involved. After a few moments of friendly small talk, the filmmaker can segue the conversation into technical matters. The filmmaker and the interview subject should work together to choose a place to conduct the interview. The main consideration for an interview location is to sit where flattering light will illuminate the interview subject’s face. Next to a window can be a good location for an interview. Choosing an outdoor location can provide some of the best light as long as the view is nice and the noise levels are relatively quiet. If no natural light is available, having the interview subject sit next to a lamp is preferable to overhead lights. Overhead lights, especially fluorescent overhead lights, are not very flattering. Overhead lights can create dark shadows around a person’s eyes. If overhead fluorescent light is the only thing available, the filmmaker should try to get some bounced light onto the person’s eyes by using a white reflector to redirect light from the overhead light source. Bouncing light can be accomplished by using a white foam core board as a reflector or having the interview subject sit at a desk with white office paper on the desk in front of them. Any way to get a white reflective surface near the person’s face will help brighten up the interview subject’s face by filling in the eye shadows created by the overhead lights. If one has access to a light kit then many more options for lighting an interview become possible. A light kit does not have to be expensive. One can buy a clamp light from a hardware store for less than ten dollars. A few clamp lights in a plastic bin with a couple extension cords, a clothespin, and sheet of diffusion (white semi-opaque fire resistant paper) make a perfectly good, low cost, light kit. Three-point Interview Lighting. 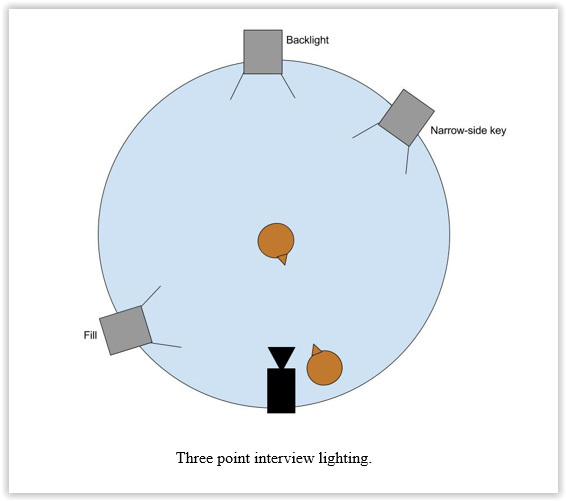 A traditional approach to lighting an interview is to use a key, fill, and backlight to make a three-point lighting setup. The key light is the brightest light in the three-point lighting setup and provides the primary illumination for the subject. The dimmest light in a three-point lighting setup is the fill light which is placed opposite the key, and serves to fill in any unwanted shadows created by the key. The backlight is placed opposite the camera and creates a rim around the subject’s outline which serves to separate the subject from the background. Alternate Key Light Placements. The placement of the key light will affect the mood of the scene. 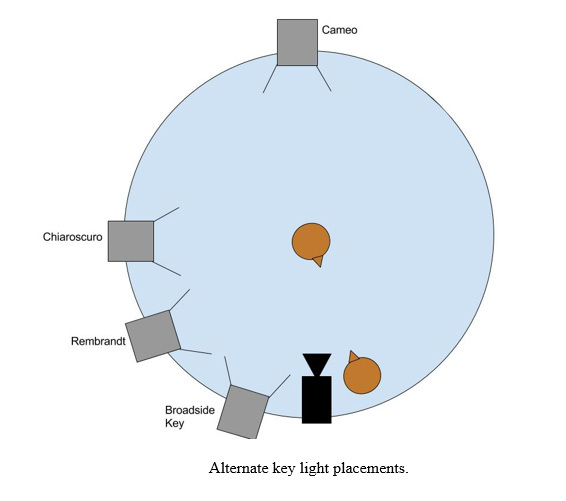 Different genres of movies use different key light placements. For example comedies and newscasts often use a broadside key which is placed very near to the camera and creates almost no nose shadow when the actor faces the camera. If a nose shadow does exist in a broadside key lighting setup, it falls on the side of the face not shown on camera. Dramas will likely want to use a narrow-side key light where the nose shadow is on the side of the face facing the camera. This type of lighting cues the audience to expect a serious tone in the movie. Dramas also sometimes employ Rembrandt lighting which seeks to create the type of light found in paintings of the Dutch painter, Rembrandt. Rembrandt lighting has one side of the face completely lit and a triangle of light under the eye on the other side of the face. Chiaroscuro lighting is very dramatic and typically used in art house movies. Chiaroscuro lighting creates stark contrasts between light and dark areas with the brightest light originating from one side of the main figure. Using this approach, the subject will appear on camera often with one entire half of their face in shadow. Chiaroscuro lighting is reminiscent of the lighting in the paintings of the Italian painter, Caravaggio. A rarely used alternate key light placement is cameo lighting, where the key light is set directly behind the subject to create a dark figure outlined against a bright background. Sometimes an interview subject may wish to remain anonymous. If a cameo key light placement is used without a fill light, it casts the subject’s entire face in shadow, making the person on camera difficult to identify. Of course filmmakers want to put interview subjects at ease so they will feel comfortable expressing themselves during the interview. However, when choosing a chair for an interview subject to sit in, a filmmaker should choose one that is not too comfortable. A person will naturally have better posture if they are perched on a barstool than if they are reclining in an easy chair. Good posture looks better on camera. Another drawback to having a subject sit in a reclining easy chair is that the background is touching the back of their head. Having the subject too close to the background creates compression on the Z axis or the space between the camera and the horizon. In general filmmakers should try to create some distance between the subject and the background to visually set the person apart from their surroundings. Placing the background too close to the subject can cause the subject to blend into the background and give the viewer the impression that there is nothing special about this subject. More important than having good lighting in a Documinute is having good sound. My first passion is lighting a scene, but I realize that viewers might not care about that as much as I do. On the other hand, viewers will not put up with watching a documentary with bad sound. It is absolutely crucial to make sure the interview footage has the best sound quality possible. That means using a built-in microphone on a camera is not the first choice for audio recording. A good plan for sit-down interviews, is to use a lavalier or clip on microphone that plugs into the camera. If several people are working on a documentary together, one person can be the designated sound person. The sound person holds a boom (long pole sound people use) with a shotgun (hyper cardioid) microphone pointed at the interview subject. A sound person can carry a mixer to control the sound levels before the sound goes into the camera. A sound person can even carry a digital audio recorder that is not attached to the camera at all. When the sound is recorded separately from the picture it’s called two system sound. If using a camera that has sound level meters, one should always use them to do a sound check. The meters should be high enough to occasionally go into the red. If the meters are in the red the whole time, turn down the gain. If the meters are never getting high enough to go near the red, one should check to see if the camera has a switch to turn on phantom power or power that runs from the camera to the microphone. A filmmaker who is interviewing the subject while running the camera might not want to wear headphones for the entire duration of the interview. Headphones that monitor the camera’s sound can sometimes cause a delay that is distracting. The filmmaker should definitely put on the headphones at least once during the sound check, to make sure that the sound levels are reading on the meter and also sound good. During the sound check is a good time to make sure the correct audio input is selected. It’s always a good idea to double check that the sound being recorded is coming from the microphone which is plugged in, not a built-in microphone on top of the camera. Interview Questions. I’ll be sitting by the camera, you can make eye contact with me during the interview. You don’t need to look into the camera. Could you please say your name and your title? Lighting Setup. Use this space to sketch a diagram of how the interview is lit. This is good practice to learn from experience and so the lighting set-up can be recreated if necessary. ❏	Recording media (memory card) in camera. ❏	Power source (battery or plugged into wall). ❏	Interview subject puts the clip on microphone up through their shirt so the cord is hidden during the interview. ❏	The recording levels are high enough to go into the red once in awhile. ❏	The camera is recording sound from the lavalier microphone, not the built in microphone. ❏	Make sure the interview subject is in focus. ❏	Adjust exposure or set camera to automatic exposure. 1. Set up an appointment to interview someone and arrive on time. 2. Set up lights and microphones to get the highest possible image and sound quality. 3. The filmmaker should sit as close to the camera as possible and ask the interview subject to maintain eye contact with them during the interview. 4. Half an hour of interview footage is enough for a Documinute. In addition to the interview footage, a Documinute will also need B-roll footage. What is B-roll? The simplest definition is “any footage shot for the documentary that is not the interview.” How much B-roll should one shoot for a Documinute? I usually try to shoot equal amounts of interview footage and B-roll. For a 60 second documentary I will shoot a 30 minute interview as well as 30 minutes of B-roll. Although B-roll does not need to be completely silent, it’s my opinion that B-roll should not have any talking in it. Once I asked an interview subject if I could get some B-roll of him at work. He agreed, but he kept stopping what he was doing to talk to the camera. When I tried to lay the B-roll on top of the voice-over it gave the impression that the interview subject’s mouth wasn’t lining up with the words spoken. That B-roll footage was unusable. Remember that B-roll in a Documinute will be edited together with audio from the interview footage. In order for the B-roll to serve its function it must not require the viewer’s full attention. The viewer will be watching the B-roll while they listen to the interview. It may be helpful to think of B-roll like illustrations in a book. A filmmaker should listen to what the interview subject says during their interview, then shoot B-roll which illustrates those ideas. In my Documinute “Library Book Pass” the interview subject says the book will be “the last book shelved at the new library.” That description was so concise and evocative that I knew I had to get a close up shot of the the cover of the book when it was time to shoot the B-roll. I used that shot as the very last image at the end of the Documinute. It worked perfectly. In another Documinute I made called “David Keller’s Matchstick Art” We shot the B-roll first, before the interview. I was able to ask the interview subject to elaborate on the images we had captured earlier. It worked out very well because he was able to talk about the artwork with the benefit of hindsight. I was able to ask specific questions about what I had seen which I knew would work well with the B-roll we already shot. When setting up to shoot B-roll a filmmaker might be tempted to put the camera very close to the action. Resist this urge! First of all, please be considerate of other spectators. A filmmaker should not become part of the show by pushing their way into the action. Aggressive photographers can be very annoying to the people around them. Remember, we are human beings first and filmmakers second. One should take every possible chance to be gracious and considerate of the people who have agreed to help by appearing in the documentary. I once attended a concert where the performers turned off their amplifiers and lights and played their final song in near complete darkness with acoustic instruments. It was very moving and the entire audience remained very quiet to preserve the ambiance the musicians had created. Except one person. A photographer in the front row was clicking away the whole time. At the end of the song, the guitar player looked that person in the eye and said “Do you have any idea how loud that is?” That is not the impression we want to leave with people about filmmakers. We want people to be happy to collaborate with us and excited to be in our films! B-roll is visual. The wide shot sets the stage, the medium shot tells the story, the close up adds drama (Kobre, 2008). Use this checklist to make sure the filmmaker gets adequate coverage (at least one of each type of shot). ❏	Make an appointment to shoot B-roll. ❏	Is this appointment an event that the filmmaker is not responsible for planning? ❏	Is this appointment a follow-up with someone already interviewed? ❏	Show up on time, be polite, thank the person who is being filmed. ❏	Set up the camera in an unobtrusive place. ❏	Shoot a half hour of B-roll. Before putting together a project one may need to complete a few pre-editing steps. Exactly what steps are required will depend on what type of camera and editing program is used as well as the workflow. Pre-editing steps may include: transferring footage from the camera to the computer, transcoding the footage from the the original capture format to a file format compatible with the editing program, creating a new project, setting the capture scratch location to a project folder on an external harddrive, and importing the footage into the project. These steps are not covered here because they are variable depending on how one’s workstation is set up. After all the pre-editing steps are taken care of, editing can begin. The first step in the editing process is to make selects or segments of footage that are selected to use. 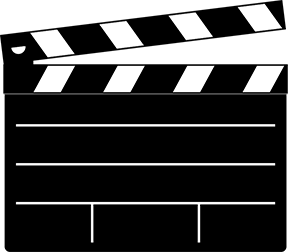 The filmmaker creates a timeline and begins dropping in segments of interview footage that contain good quotes or sound bites. I always leave some space between each select so that I can easily see where they start and end. At this point, the idea is to only pull selects from the interview footage. The filmmaker will choose selects based on the things the interview subject is saying. B-roll will be added later. Since Documinutes are 60 second documentaries, it is easy to create a three act structure for the timeline. I add a marker at 60 seconds so that I can visually see how much room I have to work within. I also add markers at 20 seconds and 40 seconds. This divides the timeline into three acts: beginning, middle, and end. The beginning is where the interview subject is introduced and establishing shots are used. The middle is where the story unfolds. The end is where the payoff happens. The final 20 seconds at the end is where something exciting should occur so that the audience is left feeling good about what they just watched. In my Documinute “David Keller’s Matchstick Art” the beginning is spent introducing the artist and his interest in collecting matchsticks. In the middle he describes how long it took him to painstakingly create a landscape picture from matchsticks. In the last twenty seconds of the Documinute I show him setting the art on fire with a small crowd gathered to watch. The crowd reactions are exciting because they express what the viewer is thinking. No matter who the interview subject is, they have something to say. One of the jobs of the filmmaker is to listen closely to the interview subject and really try to understand what it is the interview subject wants to say. In the editing room, I try to remove all the little extraneous placeholder sounds an interview subject says between their thoughts. These are sounds like “um” and “uh”. Long pauses between words are also going to get cut out in an effort to present the interview subject’s statements in the best light. As long as the filmmaker is not changing the meaning of what the interview subject says, removing these tiny vocal noises will help the interview subject sound intelligent and articulate on film. It will become apparent as the filmmaker selects interview clips to drop into the timeline, that a 30 minute interview contains many more sound bites than will fit into a 60 second documentary. That is perfectly ok. The process for making a Documinute allows the filmmaker to have plenty of material from which they can choose the best possible selected clips from the interview. The filmmaker should spend most of the time in the editing room assembling the soundbites in the order that sounds best. At this stage there is still no B-roll involved in the editing. I have heard documentary editors call this stage of editing the radio cut or blind assembly (Hullfish, 2016) because it should be judged without paying attention to the visuals. Once the filmmaker has the radio cut finished, it is time to add B-roll. Once the radio cut is complete, adding B-roll is easy and fun. I usually delete the audio from B-roll clips unless there is a particular ambiance I want to keep from the audio of the B-roll, such as the cheering of a crowd or the splashing of dogs in a pool. Deleting this audio reduces the background noise so the interview audio sounds clearer. In addition to adding visual interest, B-roll can cover all the little skips and jumps in the interview footage where “um”s and “uh”s have been removed. When the interview subject first introduces themselves, at the beginning of the Documinute, I show their face clearly with a lower third. A lower third is text that takes up the lower third of the video screen. In documentaries these are used to state the name and job title of the person on screen. Lower thirds only need to appear for a few seconds at the start of the clip when the person first appears on screen. Even though many videos are intended to be distributed on websites, it’s still good practice to make sure any text and graphics fall within the title safe area. The title safe area is the area that will not get cut off if the video is screened on a television. Title safe markers can be turned on or off in most editing programs. Some video editing programs come with royalty-free songs included. Collections of royalty free songs are also available for purchase. Songs licensed under Creative Commons are often free for filmmakers to use as long as they are properly credited. Also, it’s easier than one might think to simply record one’s own song and use that as background music in a Documinute. I also know filmmakers who have had a lot of success simply contacting the band whose song they wish to use and asking permission. There are so many options for using music with permission, it’s a very exciting time to be a filmmaker. Once everything is together, export the movie out of the editing program and into its own self-contained file. Since so many people are using video sharing websites, most video editing programs have an option to export directly to an online platform. I recommend also exporting a master file at the highest resolution possible and saving that to a portable hard drive. This step of creating a master means that if the filmmaker ever needs to make another copy of their movie they don’t need to open the video editing program to do so. Promoting a library event is a task that can be complicated. Some people are quite experienced with marketing and promotion. Enlisting the help of others who have more experience with this particular type of work can make the process easier. Avenues for promotion that one could try include: public service announcements at a local college radio station, printed fliers and posters, and sending press releases to local newspapers and television stations. The single type of promotion I have had the most success with is the personal invitation. Reaching out to a person one-to-one through social network messaging or phone can be extremely effective. This approach gives the person a chance to ask questions and learn more about what the event is all about. The best personal invitation I ever received was a request to contribute to a crowdfunding campaign for a short film one of my friends from film school was making. He sent me a private message on social media asking how my kids were doing and telling a funny story about something that happened to the two of us while we were in school together. Receiving that message made me feel valued. Because my friend took the time to make the message personal, I felt that I was being invited to be a part of something. I donated and I felt ownership in his project. This type of fundraising (or promotion) makes people feel good to be a part of what the filmmaker is creating. I really can’t think of a more important thing a filmmaker could do. Kobre, K. (2008). Photojournalism: The professional’s approach (6th ed.). Focal Press. Small, E. (2013). Direct theory: Experimental motion pictures as major genre (2nd ed.). Carbondale, IL: Southern Illinois University Press. Click on the next path below this article to view some of the Documinutes videos hosted on the Vimeo site, or click the related link here. To experience all the related videos, please visit the Documinutes Blog, and explore. Muriel Green works as Office Coordinator for the Northeast Kansas Library System. 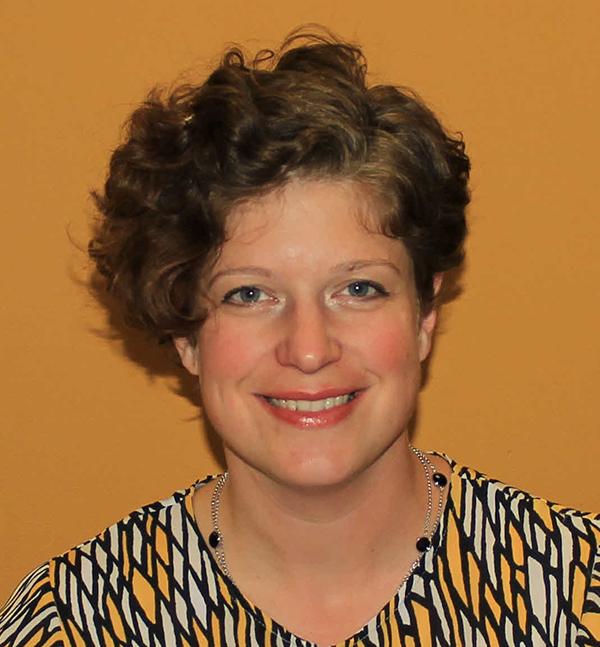 Her previous positions have included public library circulation, academic reference, and freelance filmmaking. Green received her MLS from Emporia State University and her Bachelor's degree in film from the University of Kansas. Green continues to make films at https://documinutes.wordpress.com/. She can be reached at muriel.green@gmail.com. Discussion of "Documinutes: 60-Second Documentaries"
Version 25 id 823385 of this page, updated 04 August 2016 by Shalin Hai-Jew. Created by Shalin Hai-Jew.